The candidates with sound knowledge of computer programming (Linux/Fortran/Matlab) will be preferred. GP 1800/- + admissible allowances. Age Limit : 21 to 35 Yrs. Age Limit : Head Constable 18 to 25 Yrs and Constable 18 to 23 Yrs. Post : Professor, Finance Officer, Assistant Librarian etc. Age Limit : 21 to 27 Yrs. Post : Director, Professor, Associate Professor, Assistant Professor, Librarian Etc. Experience : Minimum two years post qualification experience with reputed companies for marketing of chemical fertilizers/hybrid seeds/pesticides/bio-fertilizers etc. Projects and Developments India Ltd.
Qualification : Engineering with 60% Marks and MAT Score Card of 2012. Jobs Details :- Application are invited for the Posts of Para Medical Staff in Central Industrial Security Force (CISF). •Qualifications : The candidate should have passed 10+2 from a recognized Board or University. Diploma or Degree in Pharmacy granted by an institution of the Central or State Government.Should be registered as a “PHARMACIST” under the Pharmacy Act. 1948. •No. Of Post : 121 Posts. •Age Limit : 18-30 Years.Pay Scale : Rs.5200-20200/- Per Month. prescribed below along with requisite application fees of Rs.50/- (Rupees fifty only) in the form of Postal Order drawn in favour of the officer mentioned under column 2 below and payable at the post office as mentioned under column 3. SC/ST and Ex-Servicemen candidates are exempted from application fee. How to Apply : The last date for receipt of application form in the concerned Application Receiving Centre will be 14.09.2012. East Coast Road, Muttukadu, Kovalam (Post), Chennai, Tamil Nadu - 603 112.
age, caste, qualification etc., and a latest passport size photo affixed on the application form. with attested photocopies of the complete and upto date Confidential Reports for the last five years (if serving Central Govt. employee) shall be submitted within 30 (thirty) days of publication of our notification in Employment News . iii. 5 years of experience in secretarial work in a Government organization /Public body/an organization of repute. ii. Experience in R&D organization. 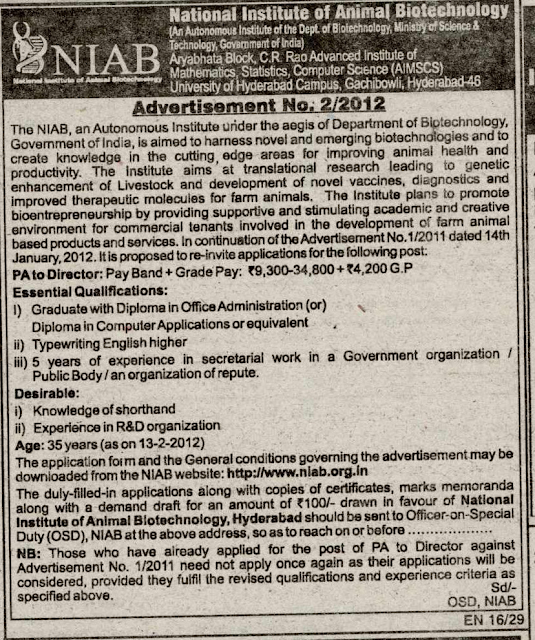 The application form and the General conditions governing the advertisement may be downloaded from the NIAB website: http://www.niab.org.in. 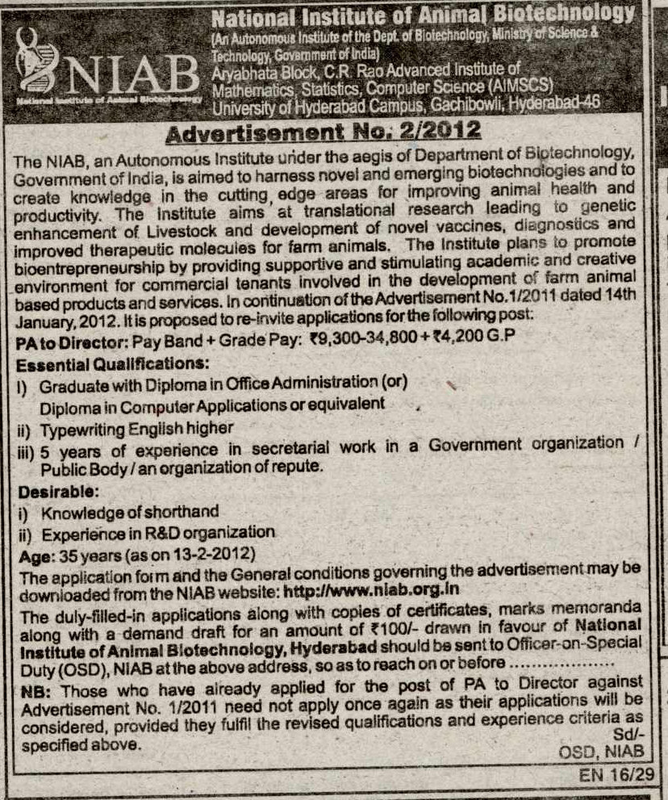 Alternatively, blank application form and general conditions can also be obtained by sending a self addressed envelope to Officer-on-Special Duty (OSD), National Institute of Animal Biotechnology, Aryabhata Block, C.R. Rao Advanced Institute of Mathematics, Statistics and Computer Science (AIMSCS), University of Hyderabad Campus, Gachibowli, Hyderabad-500 046. New Delhi, Dated 21st June, 2012. Sub: Re-circulation of vacancy to fill up of one post of Officer on Special Duty (Urban Transport) on deputation basis in the PB-4 of pay scale of ` 37400 – 67000 plus Grade Pay of ` 10,000/- in the Ministry of Urban Development.